Take a look at our new video showing our single line handwriting fonts in action! As you may be aware, we temporarily took our single line handwriting fonts off the market. This was whilst we worked with Evil Mad Scientist Laboratories, makers of the AxiDraw pen plotter, to further develop the usability of our fonts with the AxiDraw, and also ensure compatibility with other pen plotters. Evil Mad Scientist Laboratories for the latest version of the Hershey advanced Inkscape extension. This has been updated to allow the use of custom single line handwriting fonts. https://www.quantumenterprises.co.uk/handwriting-fonts/single-line-handwriting-fonts.htm or order your own custom made handwriting font and select to have it converted to single line. Whichever you choose, you will have access to the most realistic single line handwriting fonts on the market. The Jigsaw (Puzzle) Doctor make replacements for missing jigsaw puzzle pieces. Four more customers have recently written back with comments about their repaired jigsaw puzzles. A very good service all round. The quality of the manufactured piece was exceptional, and it was very difficult to spot even the slightest different in colour or texture between the old and new pieces. The system for ordering was very well explained on the website. With a digital photo, the neighbouring pieces, the packaging, the cost etc., it’s quite a difficult process to work through, but the website made this simple. In the last month I recieved my puzzle pieces back, glued them together, and framed the finished puzzle on my wall. You did a great job, and I wanted to say thank you! Missing piece arrived today. Thank you so much. We’ve converted another of our ultra realistic Premium ‘Ultra’ handwriting fonts into a single line font (also known as single stroke and open contour fonts) for use with pen plotters and other CNC equipment. You can now purchase PremiumUltra37SL, which uses the free Scriptalizer™ software to enhance it, as a single-line font for use with pen plotters (such as the Axidraw) and other CNC equipment. This means that we now have two pre-converted single line handwriting fonts, with over 40 other handwriting fonts which can be converted to order. For those people looking for the next level of handwriting font realism there are pen plotters. 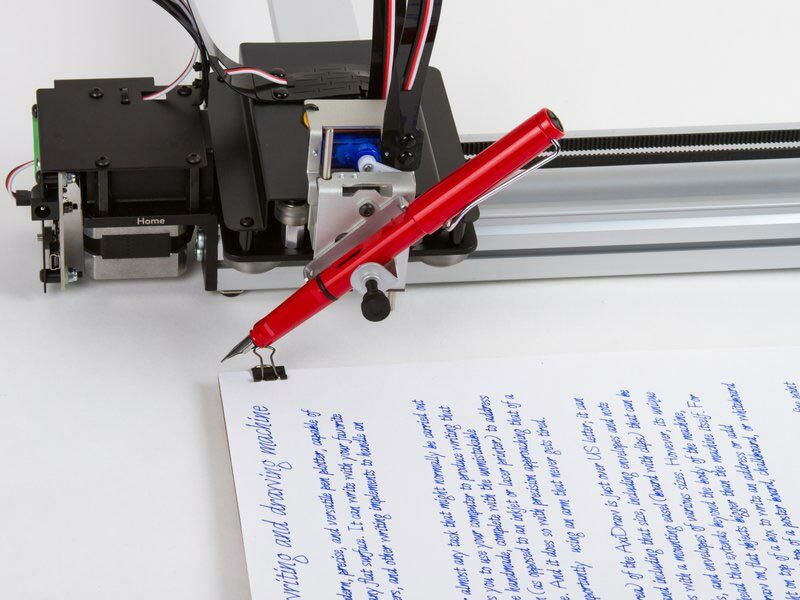 These machines, for example the AxiDraw(pictured), use real pens to mechanically create handwriting from computerised text. This adds additional realism through changes in ink density and the fact that the handwriting is actually written rather than printed. Unfortunately, standard True Type fonts are unsuitable for such equipment. This is because standard True Type fonts describe an outline for each character in the font, rather then an actual pen stroke, as per the example below. As you can see in the example above, a standard True Type font is a ‘closed contour’ font and this always produces an outline when sent to a pen plotter or other CNC machine. Every line has to describe a shape and no line can be open ended. However, there is a way to convert standard True Type fonts into ‘open contour’ (also known as single line or single stroke) fonts so that the pen only makes a single stroke per line, rather than an outline. The example below is the same font that has been converted to a single line font and written using a pen plotter. This produces the most realistic handwriting effect, with changes in ink density and other ways that pen ink interacts with the paper. Combined with our Premium ‘Ultra’ handwriting fonts with the Scriptalizer™ software, you can now create realistic handwritten documents that were never actually written by a human hand! Purchasing and installing our single line Premium ‘Ultra’ fonts allows you to copy and paste them from the Scriptalizer™ into any application that uses True Type fonts and is compatible with your pen plotter. For example, the AxiDraw uses Inkscape to output fonts. PLEASE NOTE: We are still in the process of converting our 40 plus Premium ‘Ultra’ handwriting fonts into single-line fonts. This means that not all fonts are available for immediate download, but all are available to buy. Most fonts, when ordered, will initiate a conversion to the single line format. You can now purchase our pre-made ‘example’ Premium ‘Ultra’ handwriting fonts, which use the free Scriptalizer™ software to enhance them, as single-line (also known as single stroke and open contour) fonts for use with pen plotters and other CNC equipment. We’ve had more comments from happy customers who have had missing jigsaw puzzle pieces replaced by the Jigsaw Doctor. Customer service is everything these days. Your company is awesome! It was worth the wait. I would use your service again if the need should arise and I highly recommend you to anyone who is missing a puzzle piece! I am pleasantly surprised with the outcome! I had many large pieces to be replaced. The foliage, branches and especially the blue sky are difficult to match. The jigsaw doctor did an excellent job with my puzzle, in matching the pieces as close as possible! Thank you for your help. This is QESamRoberts, a new handwriting font that has been made available in our handwriting ‘Font Vault’ for you to download and use for free*. The handwritten fonts in The ‘Font Vault’ have been made using our Premium Service and the owners have given their kind permission for you to download and use them for personal use. Whilst the Premium Service does not have the extra characters embedded that give an even more natural handwriting look in the Premium ‘Ultra’ Service, these fonts still produce a very good approximation of natural handwriting. There are now 30 high-quality handwriting fonts in the ‘Font Vault’, with both printed and cursive styles available. *Free for personal use. Requires purchase of a license for commercial use. Quantum Enterprises produces the most realistic handwriting fonts on the market. It’s not only the huge attention to detail that sets our fonts apart, it’s the addition of our proprietary Scriptalizer™ software that adds further variation to the font and makes the results more realistic than ever. Our handwriting fonts are useful for many applications, from marketing to personal letters, for doctors, estate agents, politicians, and for those who cannot comfortably or legibly write any longer. Thank you very much for this. It’s amazing how you do this, its looks so authentic and very useful for the type of work we do. A few of my colleagues have used your service now and its really helped our work be more effective and personal for our donors. It’s great.